Julie is an awesome friend of mine filled with a tremendous amount of great ideas, and I am so glad we met each other online by chance one day. I've learned so many great recipes with her, and one thing we have in common is our love of "traveling the world" through our cooking. 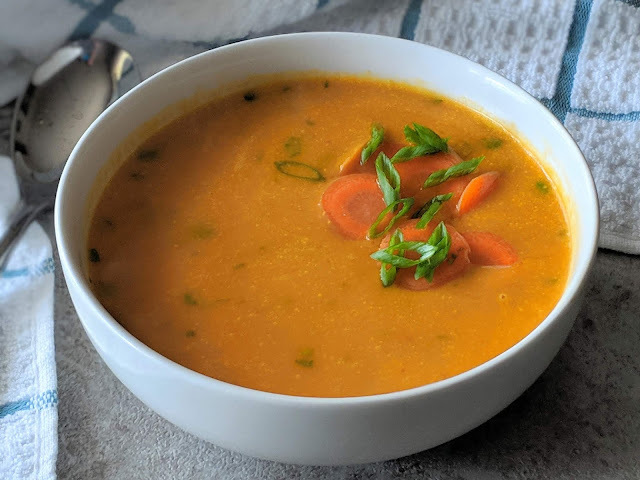 Here's a terrific and easy recipe from her for curried carrot soup, one of many posts coming from this terrific lady. Penny and I first met through an ethnic cooking group, which probably wont come as a surprise to anyone that knows either of us. I've been blogging for a few years at Pandemonium Noshery about international cooking and we both have a habit of joining Facebook groups dedicated to various types of regional cooking. One thing I always look for when traveling is trying something(s) unique to wherever I am. Except when I first got to London I was tired, cold, it was late at night, and I missed the bus to where I was staying. As everything was shutting down for the night there was one little grab-and-go type place just about to close that had a few things left. I wasn't even in the mood for anything interesting, I just wanted some soup. Which happened to be a curried carrot soup. Even in my glum mood I have to say I was pleasantly surprised at how much I loved it. So much in fact when I got home I knew I had to recreate the recipe. I love that making a large pot at home cost about the same as two small containers at the shop did. I make it the day after roasting a chicken for dinner sometimes. I boil the frame down for broth and pick of the shred of meat leftover to throw in the soup. Or sometimes I use bouillon and leave the meat out, whatever works that day. I used some lemongrass I had leftover in the freezer but it's totally optional. If you leave it out as I do sometimes just add a little extra lemon juice instead. 1. Simmer together the broth, carrots, lemon grass, garlic, red curry paste, coriander, and cardamom. 2. Keep simmering until the carrots are really tender. 3. Remove from the pan, pick out the lemon grass if using, and puree in batches. 4. Return to the pan and stir in the coconut milk, lemon juice, and any mix ins you like. 5. Cook over medium heat until warmed through. Have you ever made or had curried carrot soup? What do you put in your recipe? Does this look like a recipe you'd try? I love soup, could eat it every day of the week. I can't wait to see your spin on it! Thanks fot posting! My Amazing Scratch and Dent Store Deals!